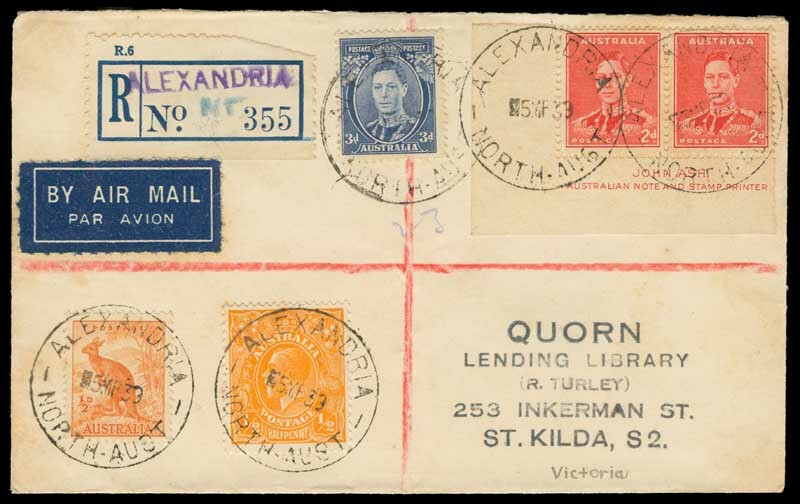 Alexandria, North Aust Commonwealth Type CDS postmark on registered Turley cover, with rubber stamped provisional registration label. 5 Full clear strikes dated 5 MR 39, probably the earliest recorded date. Rated 3R. Charlotte Waters 1922 Commonwealth type CDS (Rated R), Hermansburg 23mm Squared Circle with last R reversed (Rated 3R) and Hermansburg 27mm Squared Circle (2) (Rated 4R) on Postage Due issues. All part strikes. Money Order Office, Darwin. NT. 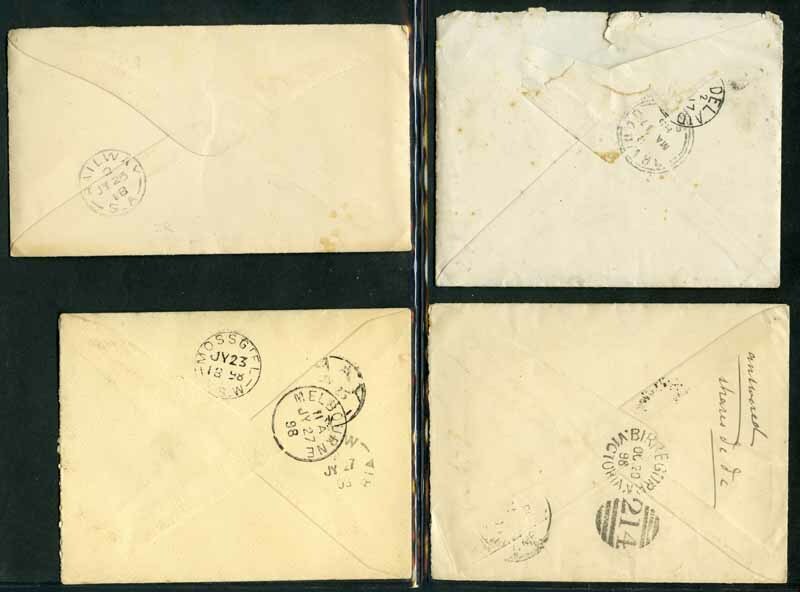 Commonwealth Type CDS postmarks (2 full strikes) on 3½d Food and a a pair of 1½d Princess Elizabeth on piece dated 24 JL 53. Unlisted by either Williams or the Philatelic Society of SA publication. 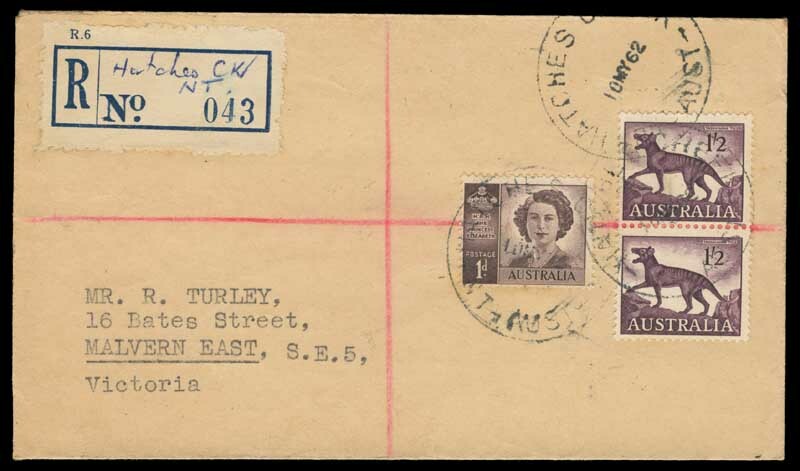 Hatches Creek, NT, Aust Commonwealth Type CDS postmark on registered Turley cover, dated 10 MY 62, with provisional registration label. Rated 4R. 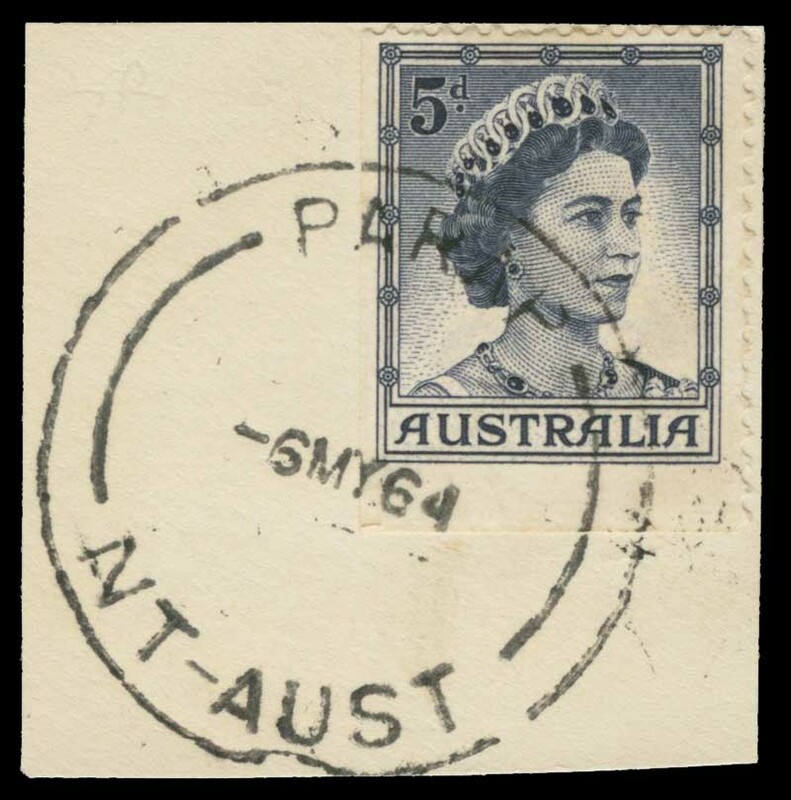 Parap Commonwealth Type CDS postmark with narrow Parap, on 5d Blue QEII issue, dated 6 MY 64, the latest recorded date. Rated 3R. Fannie Bay Place rubber CDS postmark on registered cover, cancelled on the day of the name change, with No 002 provisional registration label. 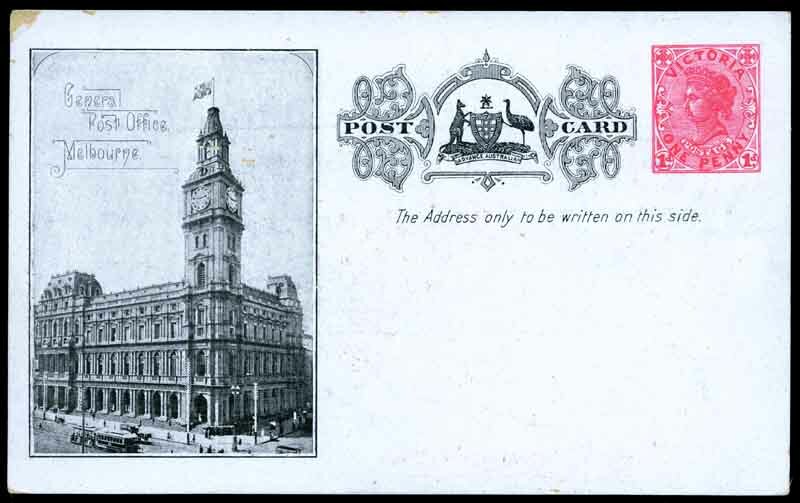 A very scarce postmark, the Post Office closing only 2 months after the name change. 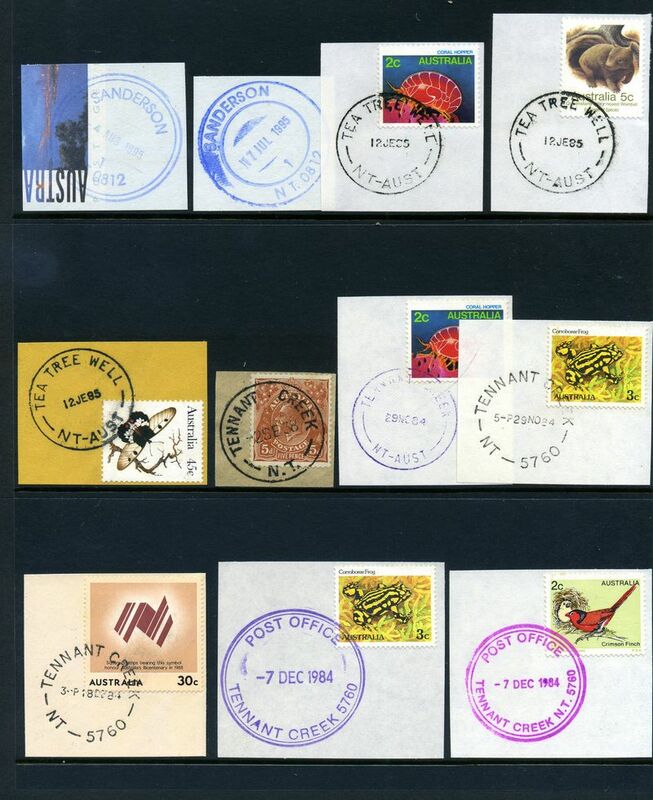 Selection of 89 postmarks from various towns ranging from Queen Victorian period to the 1980's, mostly on piece, including 6 covers. Noted strikes from Banka Banka, Borroloola, Brocks Creek, Charlotte Waters, Groote Eylandt, Howard Springs, Nhulunbuy, Roper River, Tea Tree Well, Ti Tree, Top Springs, Victoria River Downs, Wadeye, Warrego, Wave Hill (on registered cover but faint), Yirkala and Yulara. 18 rated R, 6 rated 2R and 3 rated 3R. Also 44 Registration labels. 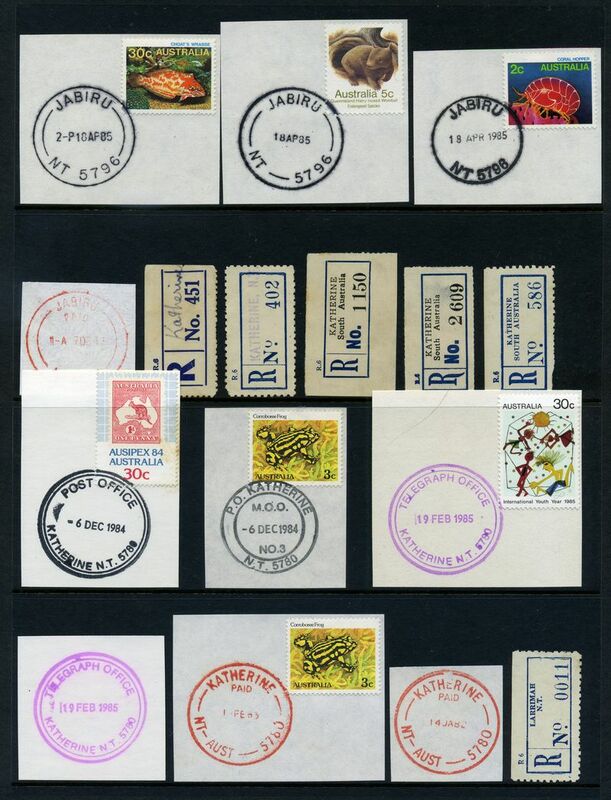 Aubu[rn] 22mm Broken Ring CDS postmark dated AP 4 72 and [Bal]aclava Full ring CDS postmark dated JA 19 81, on 2d Orange-Red Queen Victoria perf 10 issue. Rated 4R and 2R. 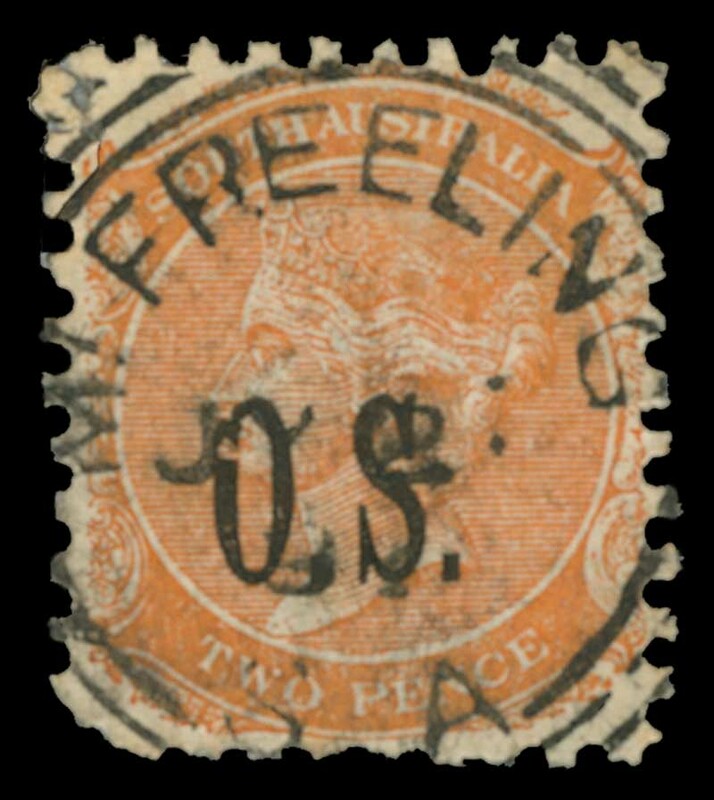 Farrels Flat Broken Ring postmark on 2d Orange Queen Victoria pair. Neat near complete strike. The Broken Ring type was spelt with a single L, later cancellations had 2 L's. Rated 3R. 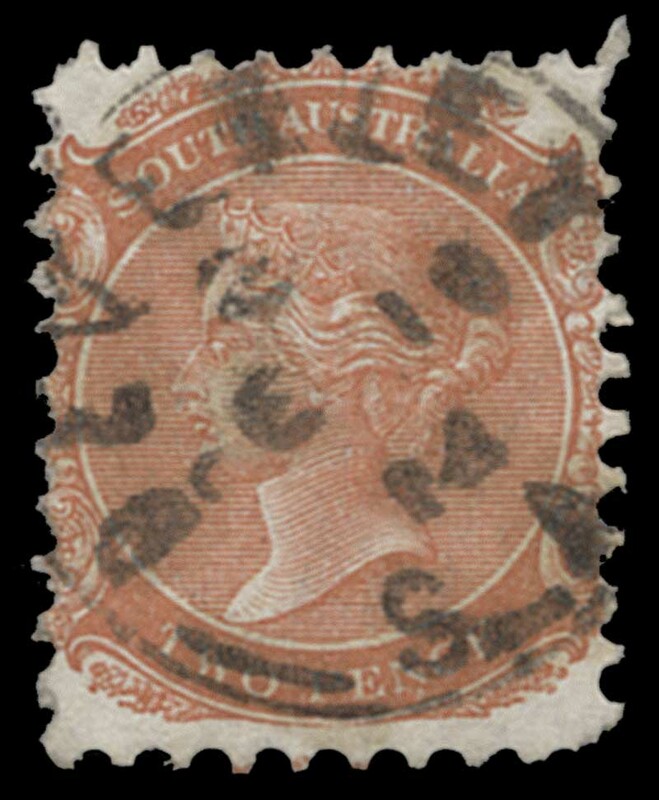 2d Orange-Red Queen Victoria on large piece, tied No 43 Diamond Numeral postmark, together with a Gumeracka 28mm Broken Ring postmark. (Rated 3R). Neat clear strikes. 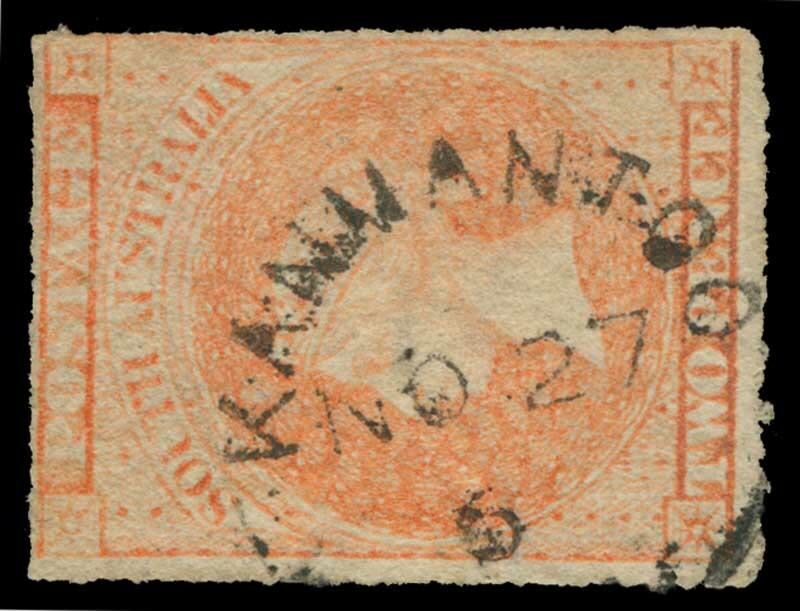 Kanmantoo 21mm Broken Ring CDS postmark on 2d Vermillion Queen Victoria Roulette issue. Neat clear strike showing the town name in full. Rated 4R. Melrose 25mm Broken Ring CDS postmark (rated 4R) on piece, franked with 2d Orange Red Queen Victoria imperf issue, tied by illegible No 86 Diamond Numeral cancellation (rated R). 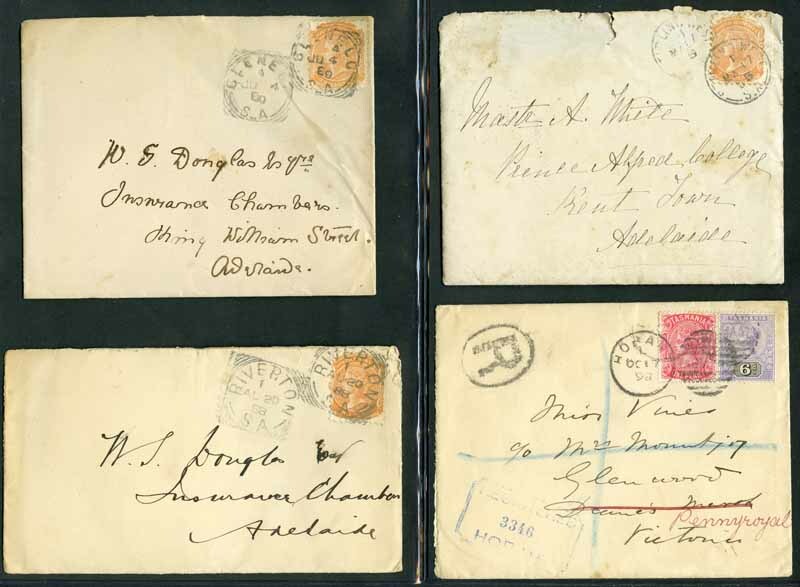 Melrose 21mm Broken Ring CDS postmarks dated AU 31 63 (2) on piece franked with 2d Red Queen Victoria Roulette issue. Neat full strikes. Rated 3R. 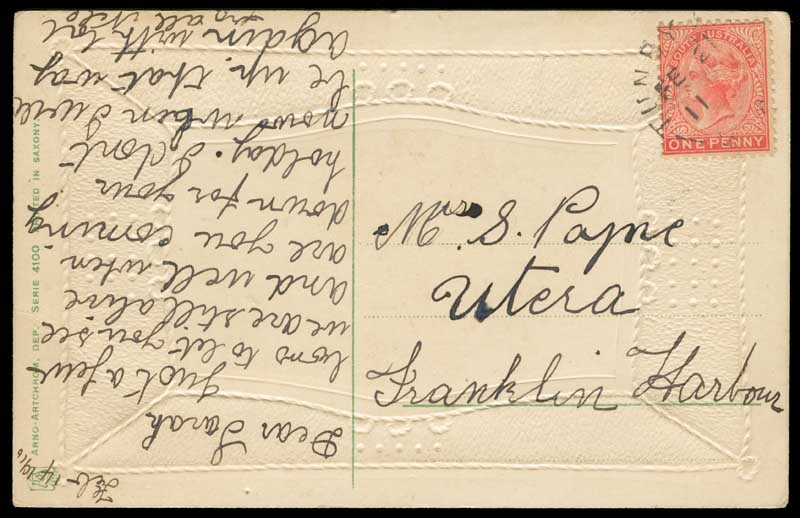 Outaalpa Broken Ring CDS postmark on 2d Orange Queen Victoria issue. A superb neat full strike. Rated 2R. 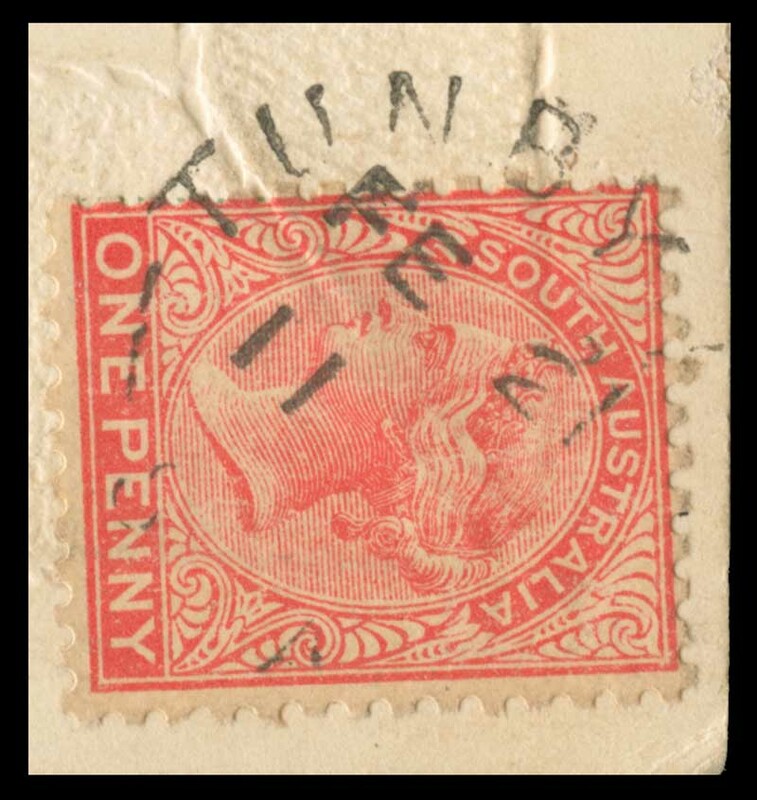 Tunby Bay Broken Ring postmark on 1d Pink Queen Victorian issue on postcard, dated Fe 21 11. A neat clear largely complete strike. A scarce spelling error for Tumby Bay, rated 5R by the P.S. of S.A. publication. 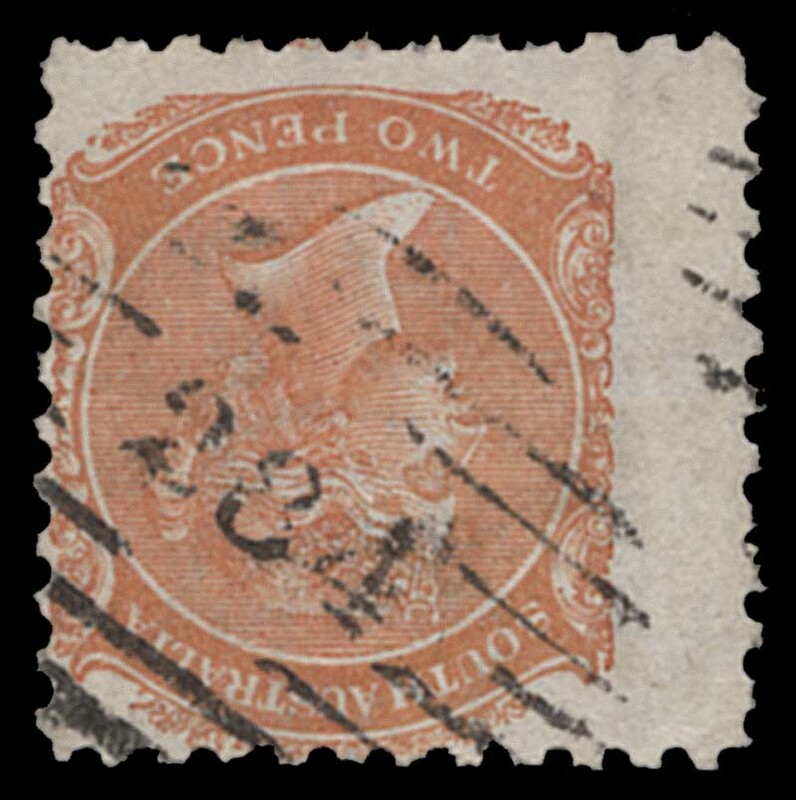 Diamond numeral cancellation number 284 [Pekina Station] on 2d Orange-Red Queen Victoria perf 10 issue. Known allocated but not seen at this location. Full clear strike. The P.S. of S.A. publication lists only known to exist in archives, and to be listed as 5R in revised edition. 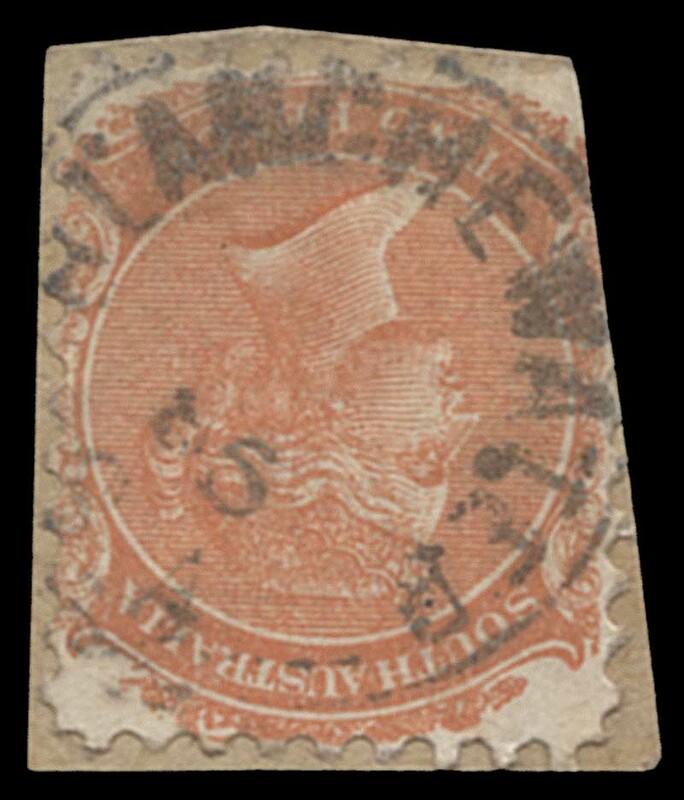 Blanchewater Full ring CDS postmark on 2d Orange-Red Queen Victoria perf 10 issue on piece. Near complete strike. Cut into at lower left. Rated 4R. 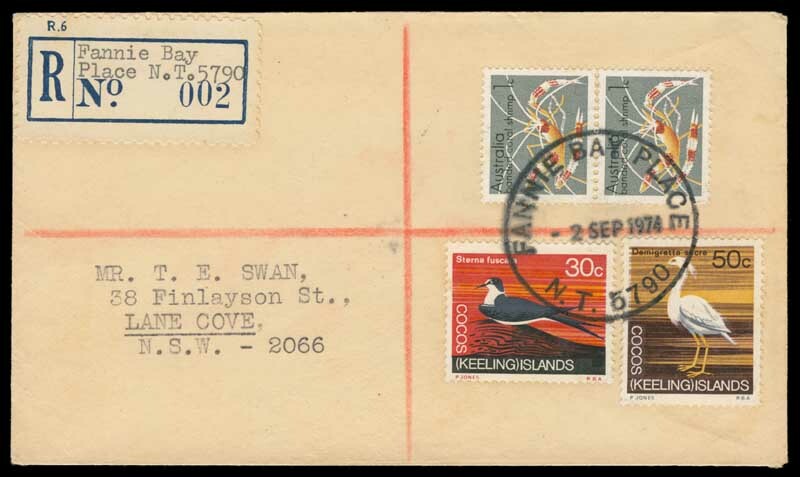 Beverley Full ring CDS postmark dated FE 1? 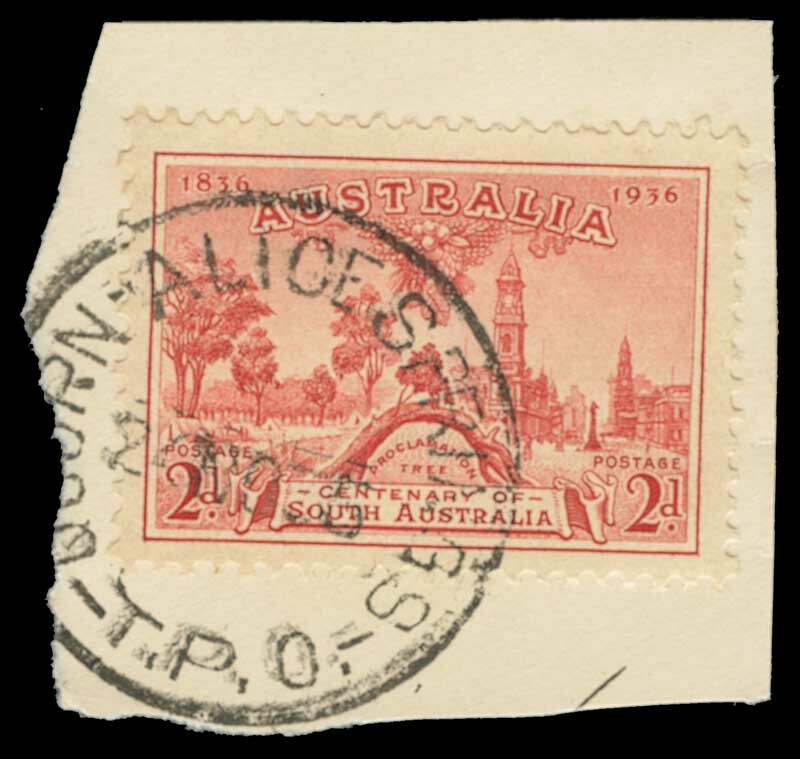 84 on 2d Orange-Red Queen Victoria perf 10 issue. Near complete strike. Rated 4R. 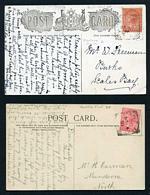 Custon Full Ring CDS postmarks (2), tieing 2d Violet and 1d Pink Queen Victoria to 1904 cover. 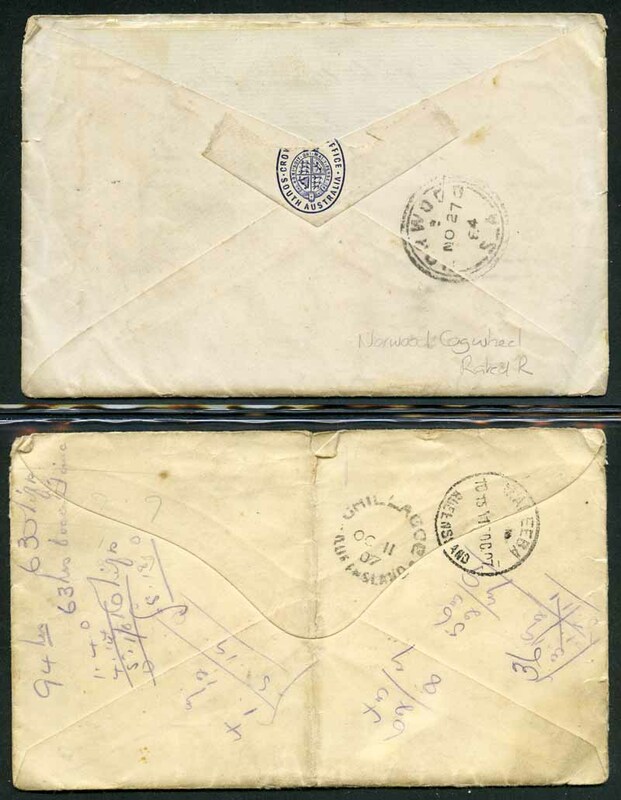 Cover torn, clear of the stamps. Both are clear full strikes. Rated 3R. Grange, Knightsbridge, Marion, Mt. Bryan East and Yahl Paddock full ring postmarks on Postcards, The Yalh Paddock on cover. 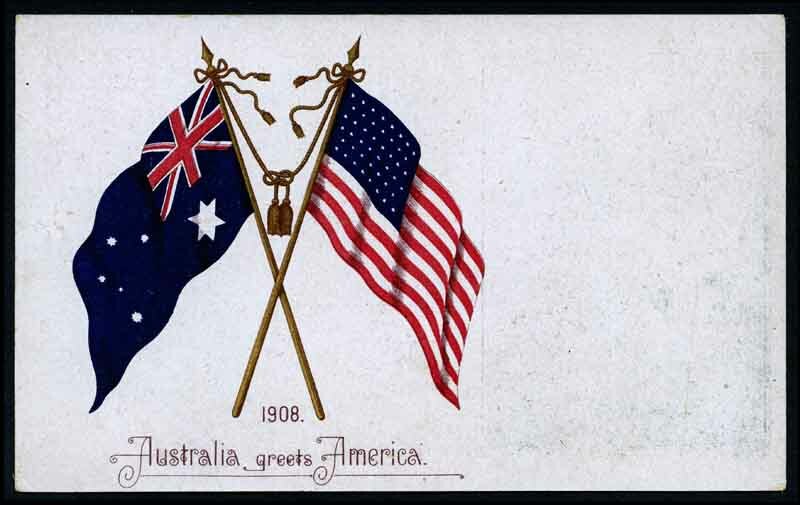 Also Torrensville Sth Australia Commonwealth Type 1 CDS without arcs, on postcard. All fair to good strikes, rated 2R. Mortlock Full Ring CDS postmark on 1909 Postcard, showing view of "Royal Pump Room, Harrogate", franked by 1d Pink Queen Victorian issue tied by 2 fair full Mortlock CDS postmarks. Rated 4R. 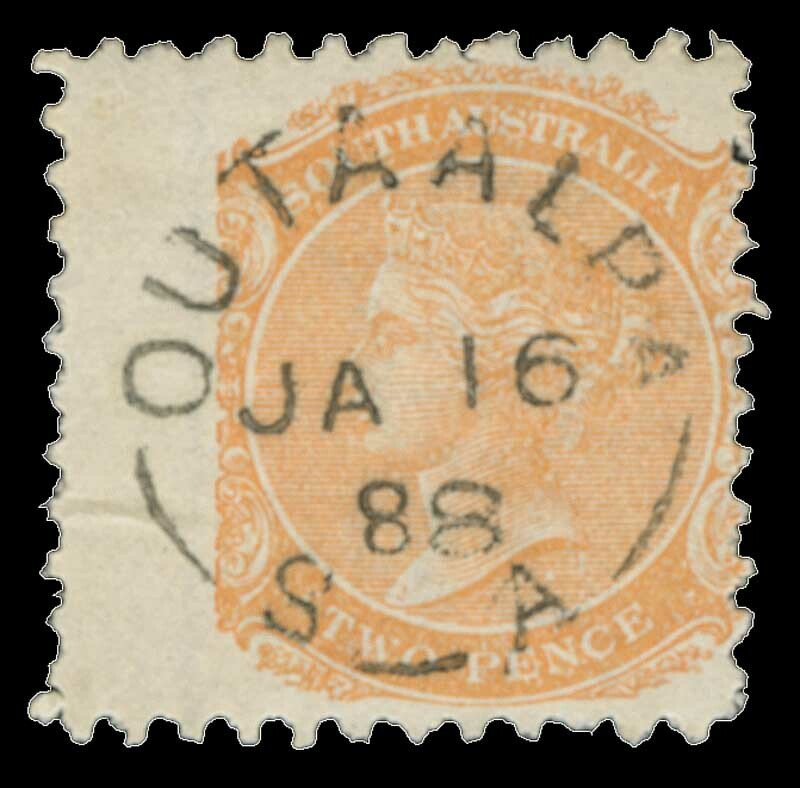 Saint's Station Full Ring CDS postmark on 2d Orange Queen Victorian issue. A partial strike showing all letters of the name. One of the few known examples of this strike and superior to that illustrated in the P.S. of S.A. publication. Rated 5R. 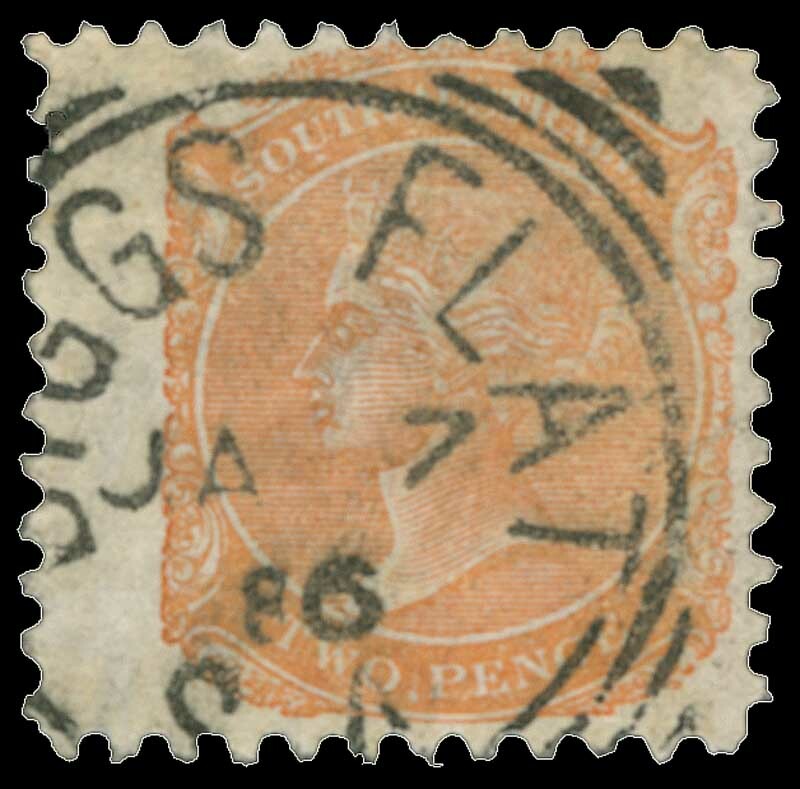 Biggs Flat Type I 26mm squared circle cancellation with bars on G, on 2d Orange Queen Victoria issue. A neat near complete strike. Rated 4R. 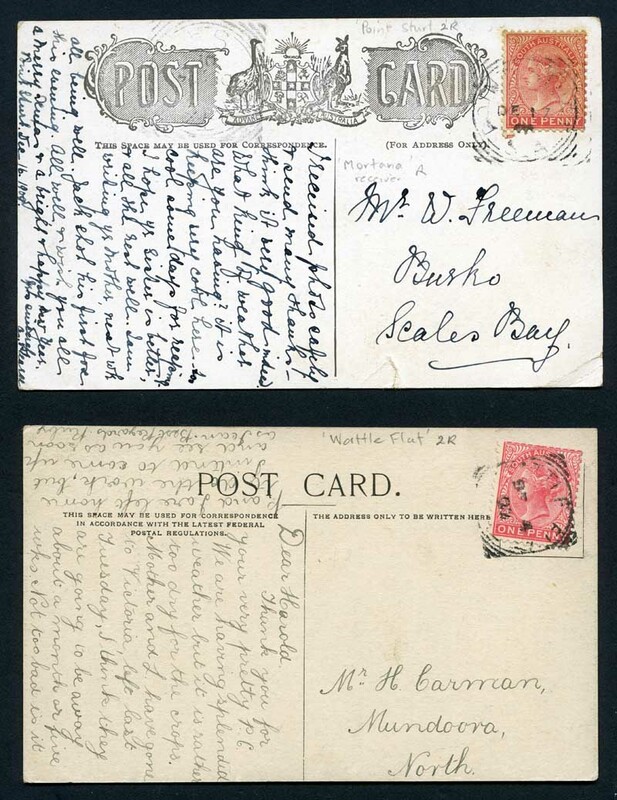 Forster Squared Circle postmark tieing 1d Pink Queen Victoria to 1908 Postcard. A neat clear full strike. Rated 3R. Grange Squared Circle postmark tieing 1d Pink Queen Victorian issue to 1909 Postcard, showing view of "Feeding the Calves". Rated 3R. Inglewood Squared Circle forwarding postmark (rated 3r) on 1907 Postcard franked with 1d Pink Queen Victoria tied by Northfield Squared Circle postmark (rated R), addressed to Inglewood. 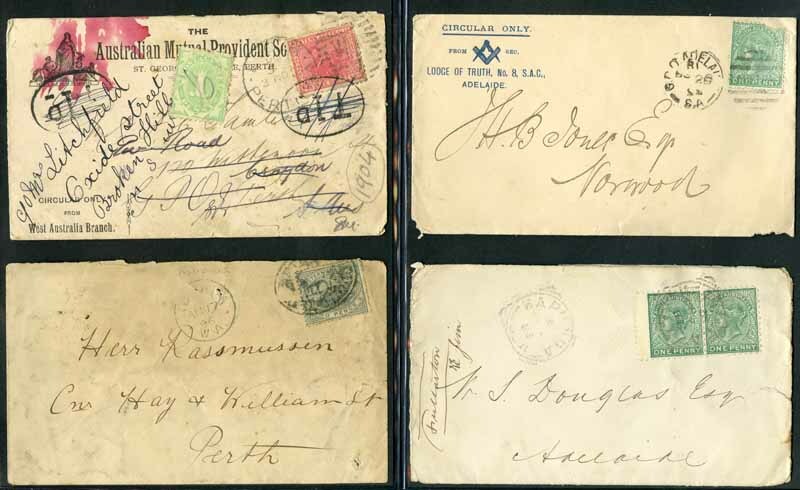 Postmarks are partly overstruck, but the Inglewood strike is complete and reasonably clear. 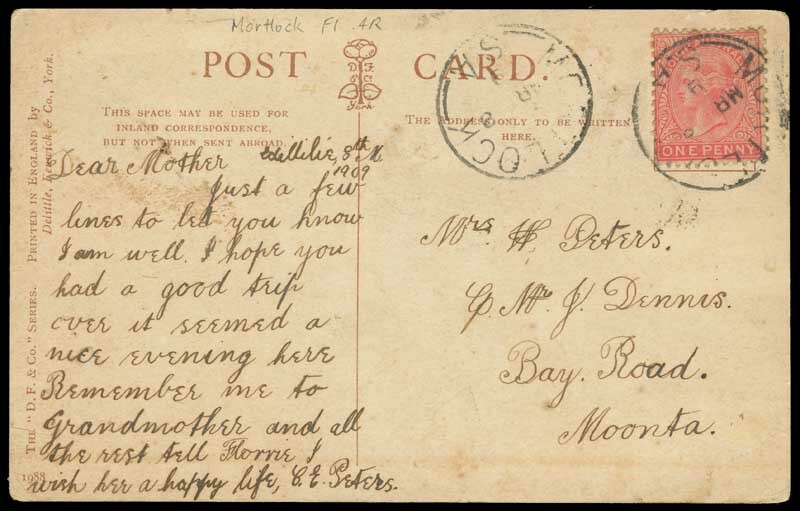 Klemzig Squared Circle forwarding postmark on 1907 Postcard of Miss Phyllis Dare, addressed to Klemzig. A neat full strike. Rated 3R. 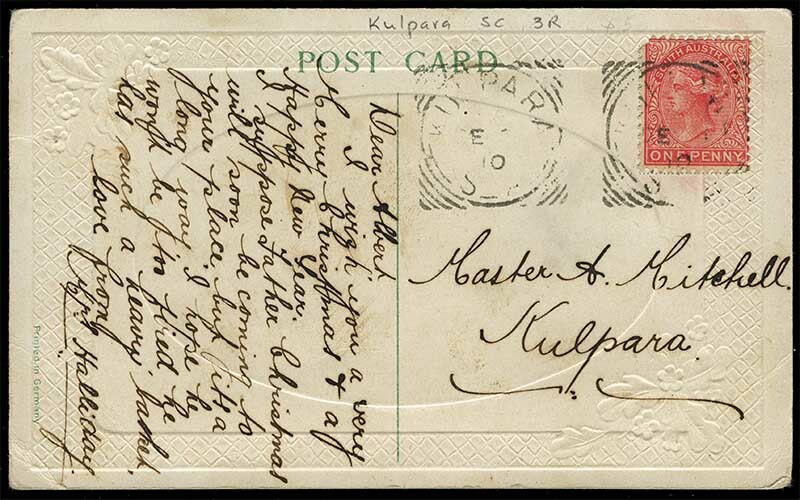 Kulpara Squared Circle postmark tieing 1d Pink Queen Victoria to 1910 Postcard, together with a reasonably clear full second strike. Rated 3R. Mt. 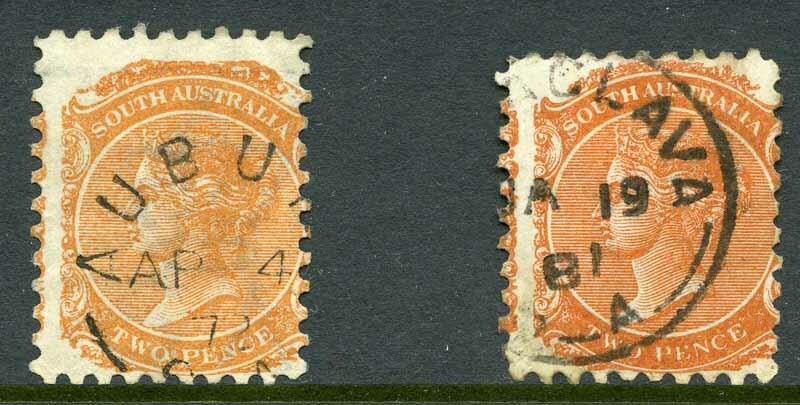 Freeling squared circle cancellation on 2d Orange Queen Victoria issue O/P OS. A near complete centrally placed strike. Rated 4R. 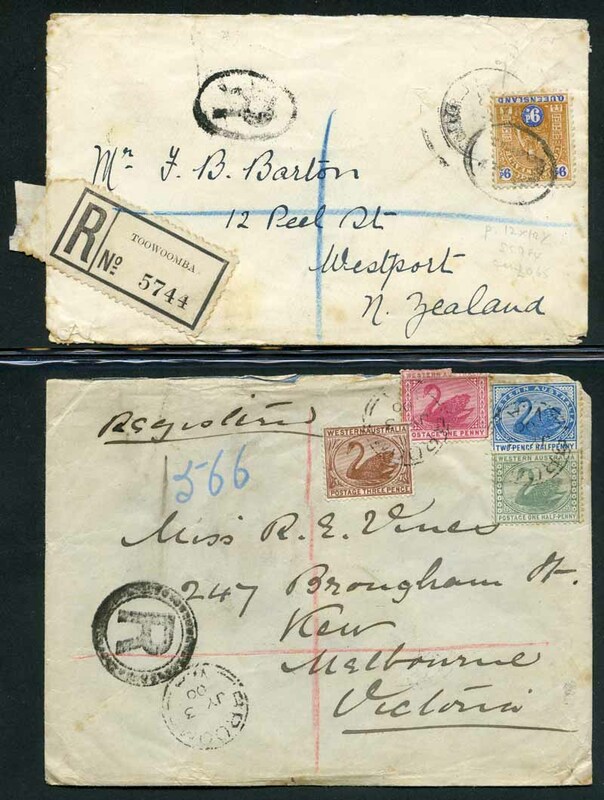 Mintaro Railway Squared Circle postmarks on 1901 cover addressed to Naples, Italy. 3 Near full strikes. Rated 2R. 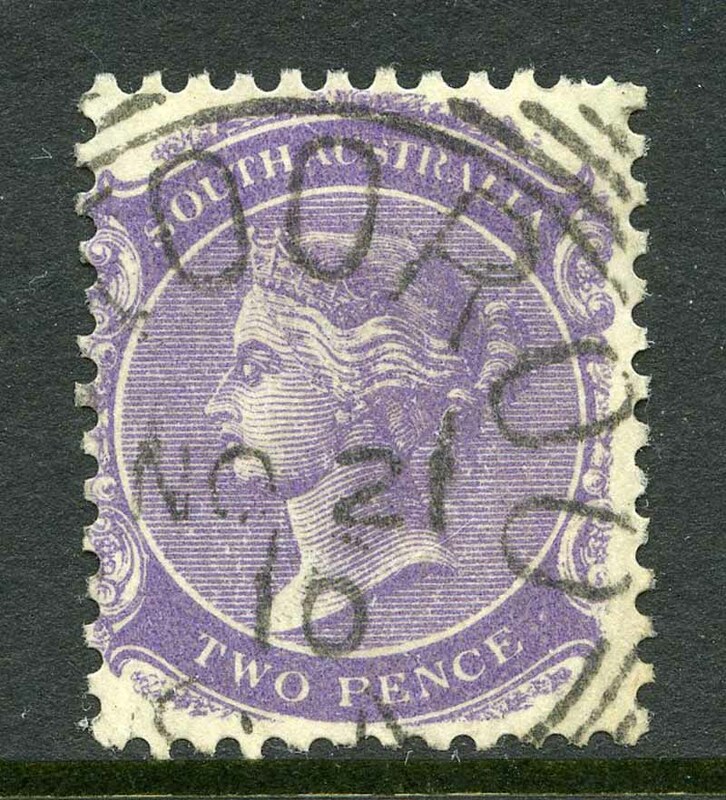 [Mu]tooroo No 21 10 28mm Squared Circle cancellation on 2d Violet Queen Victoria. Rated 4R. 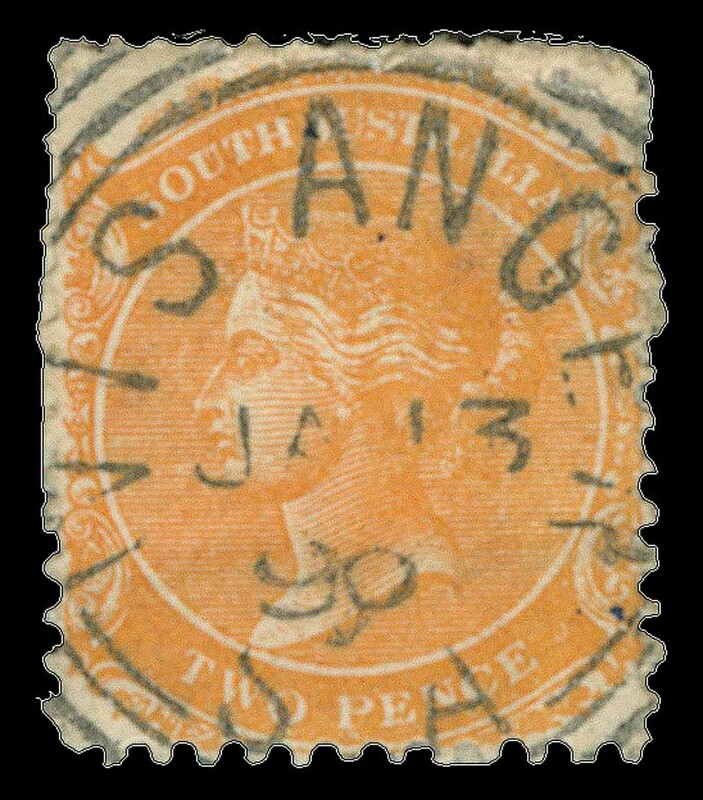 Wisanger squared circle cancellation on 2d Orange Queen Victoria. A neat clear largely complete strike. Rated 3R. 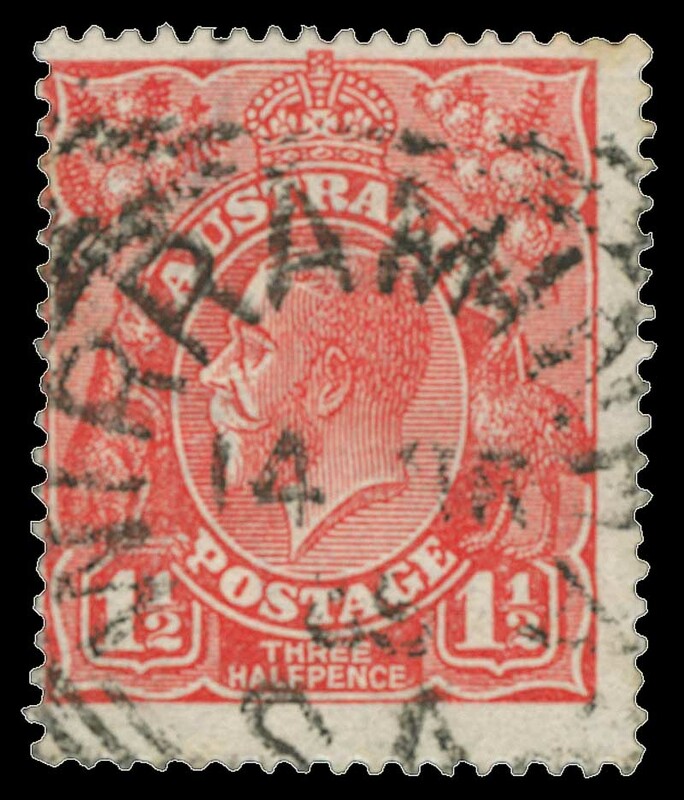 Wirraminna Squared Circle postmark on 1½d Red KGV issue. Fair near complete strike. Rated 3R. 376 Mile E.W.Rly. 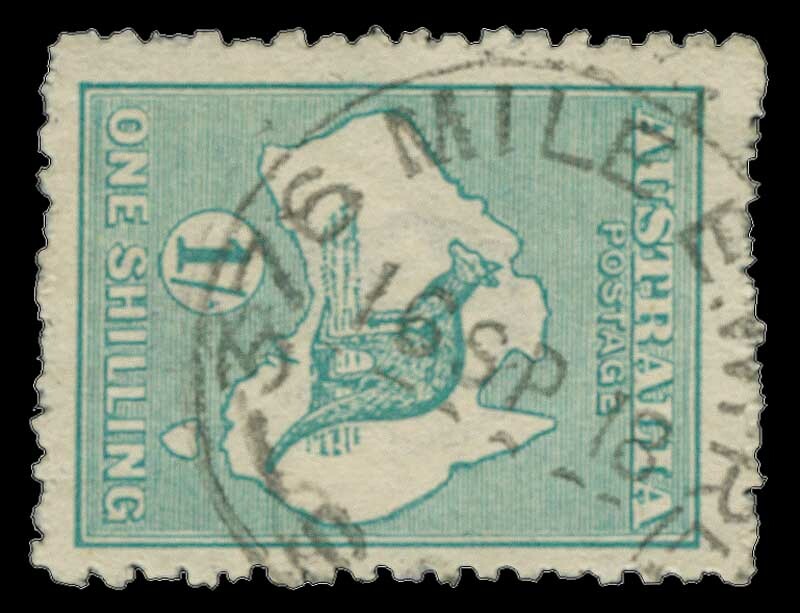 Commonwealth Type CDS postmark on 1/- Green Kangaroo issue. Neat largely complete strike, dated 16 Sp 18, a new latest recorded date. Rated 4R. 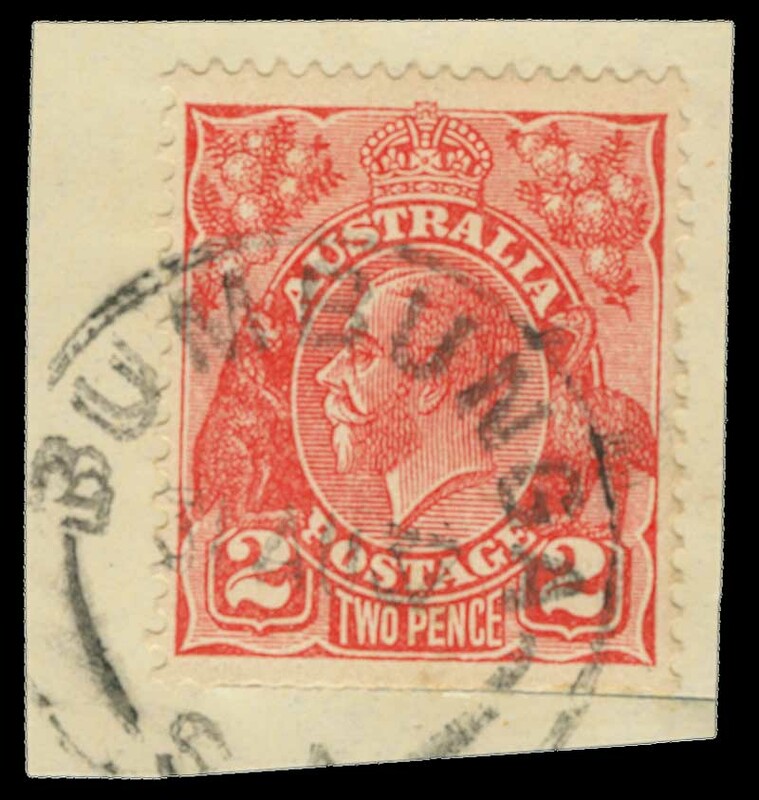 Bumbunga Commonwealth Type CDS postmark on 2d Red KGV issue. Rated 3R. 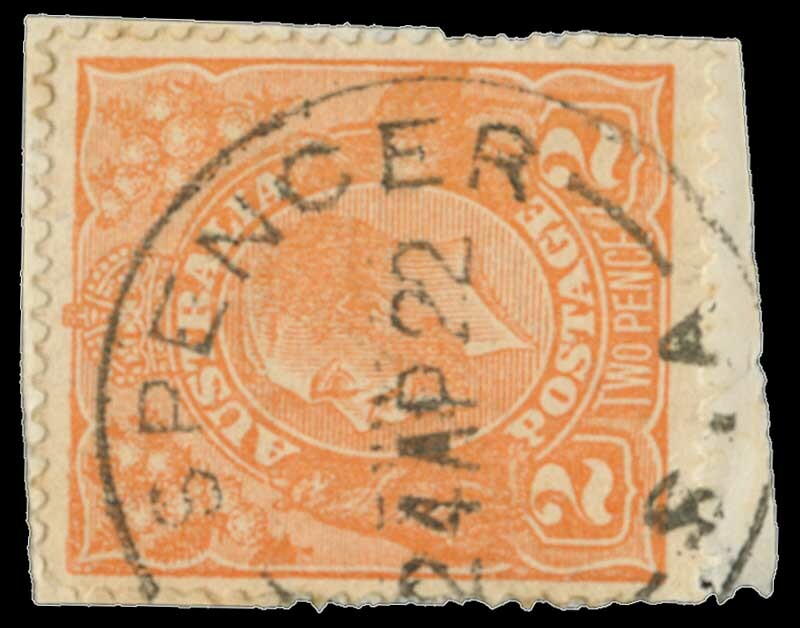 Cape Spencer Commonwealth Type CDS postmark on 2d Orange KGV issue. Rated 3R. 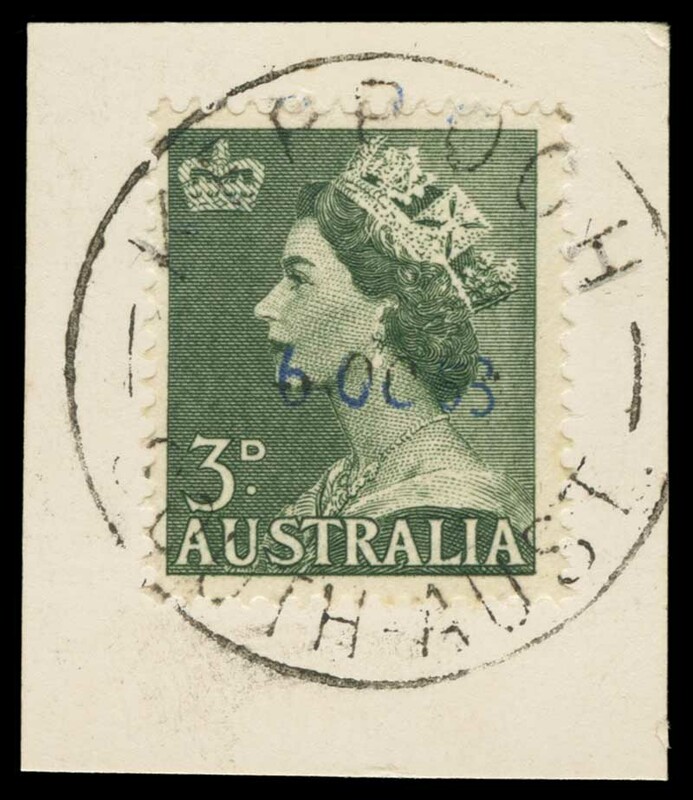 Keppoch Commonwealth Type CDS postmark on 3d Green QEII issue, on piece. 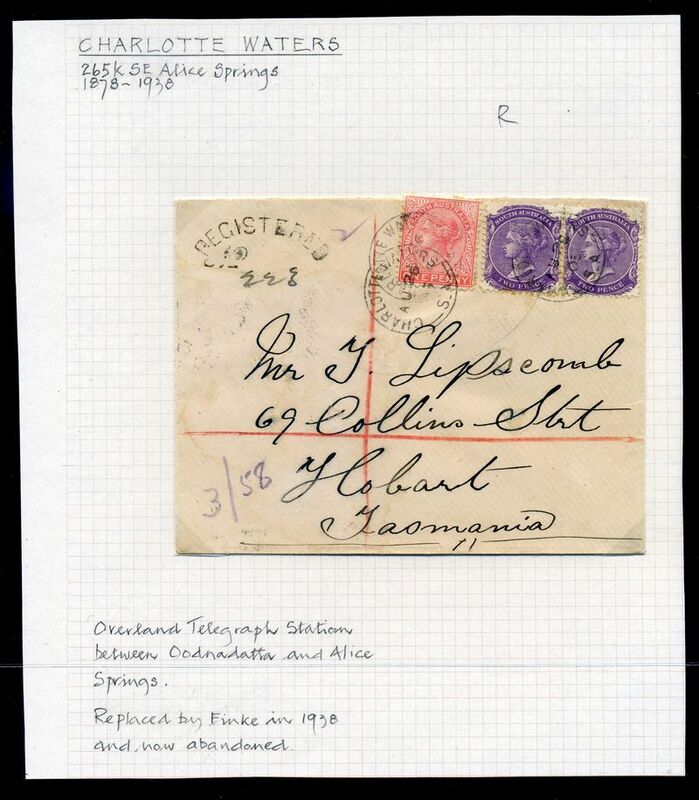 A clear complete strike, with the faint date enhanced with ink, presumably by the postmaster. The P.S. of S.A. publication records as no marking known. 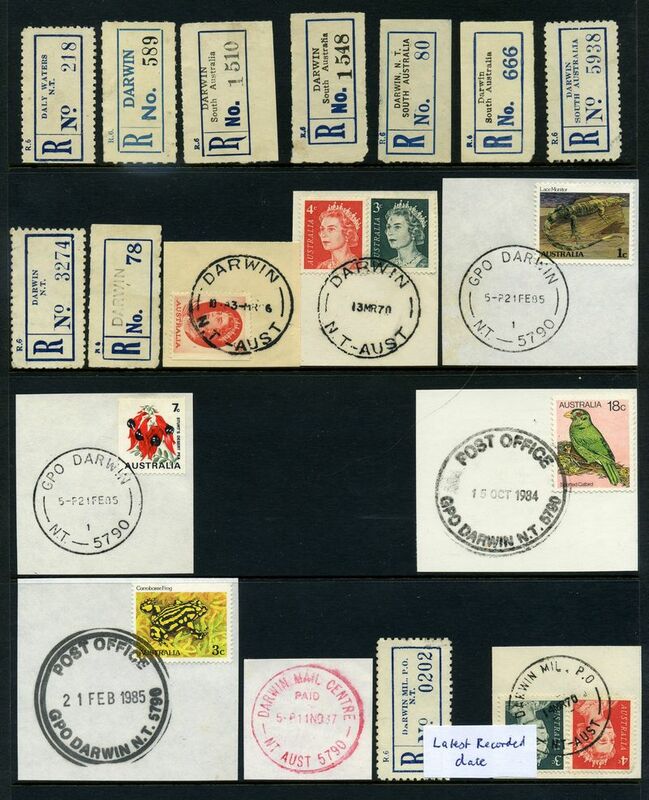 Maltee Commonwealth Type CDS postmarks on 1½d Green KGV block of 9. The block has 9 cancellations on it, 2 of which are full good to excellent strikes. Dated 23 MY 24, the matching the ERD shown in the P.S. of S.A. publication. Attractive piece. Rated 2R. 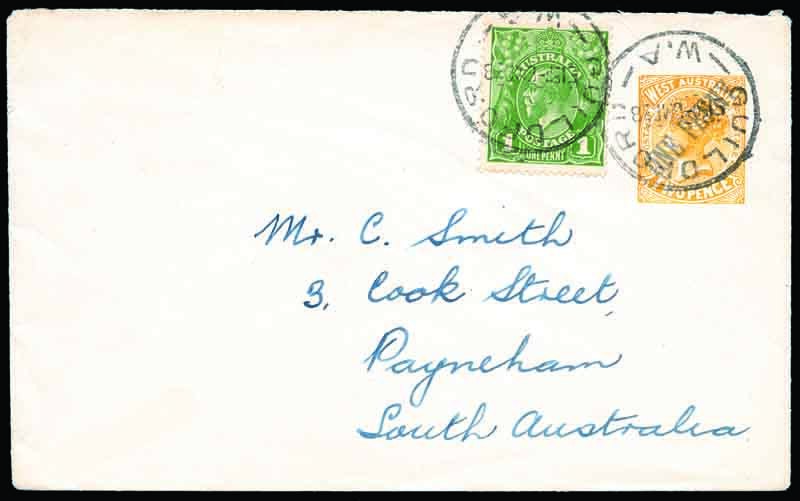 Mangalo 30mm Commonwealth Type CDS postmark on 1946 2½d Mitchell issue. Neat part strike, with the town name clear and in full. Rated 3R. 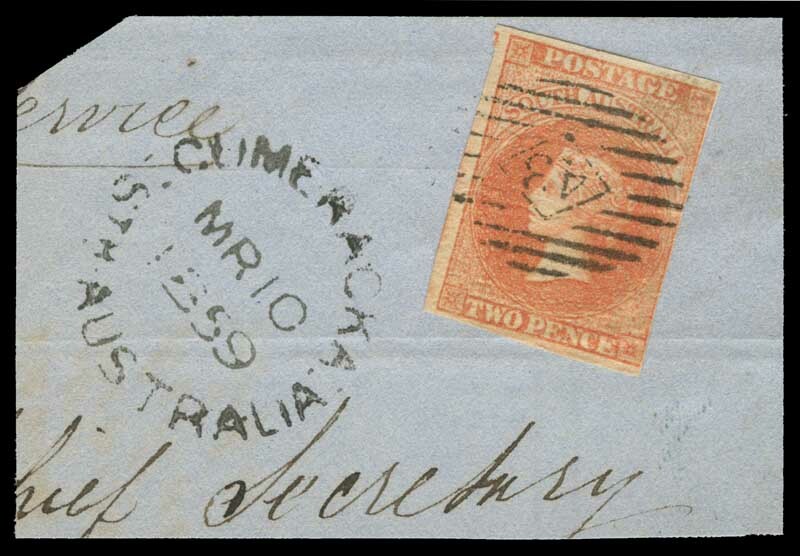 Moockra Commonwealth Type CDS postmark on 2d Red KGV issue. Rated 3R. Mt. 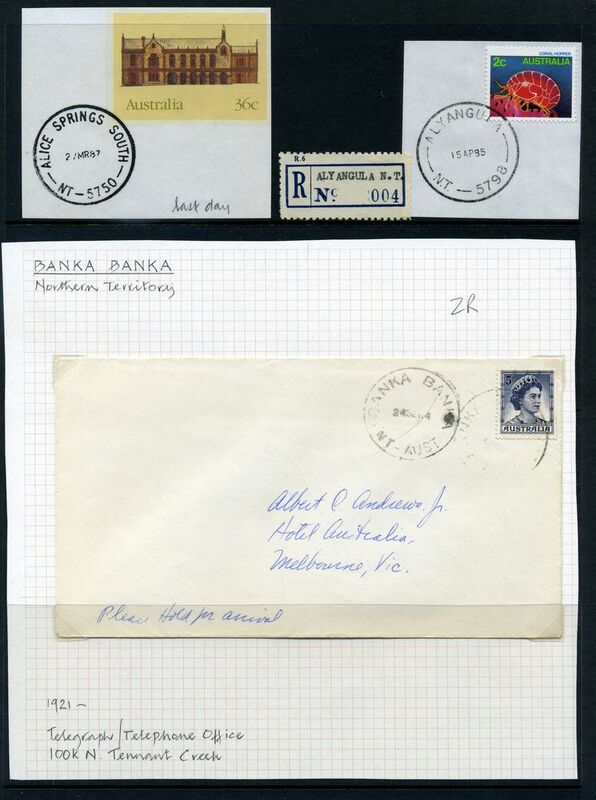 Benson 31mm Commonwealth Type CDS postmark on 4¢ Red QEII, on piece. Rated 3R. Mt. 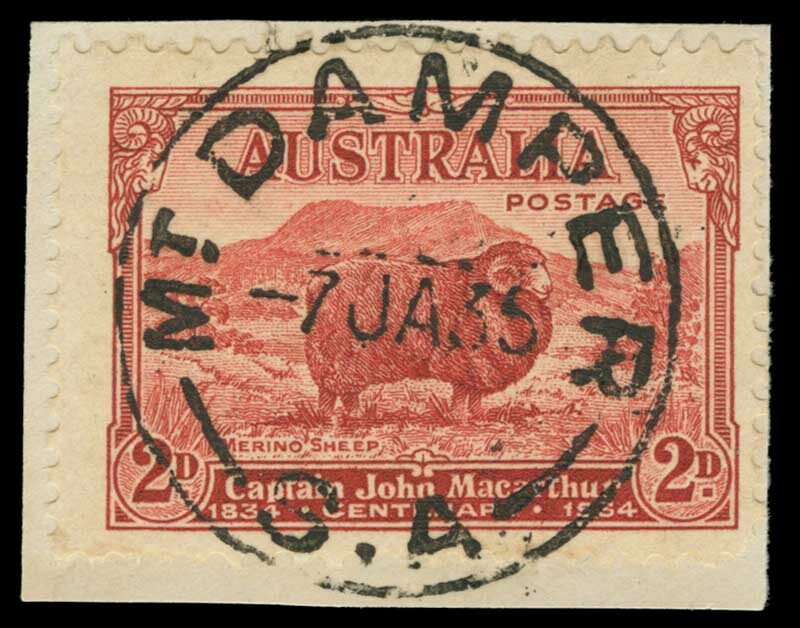 Damper Commonwealth Type CDS postmark on 1934 2d Macarthur issue on piece. Rated 2R. 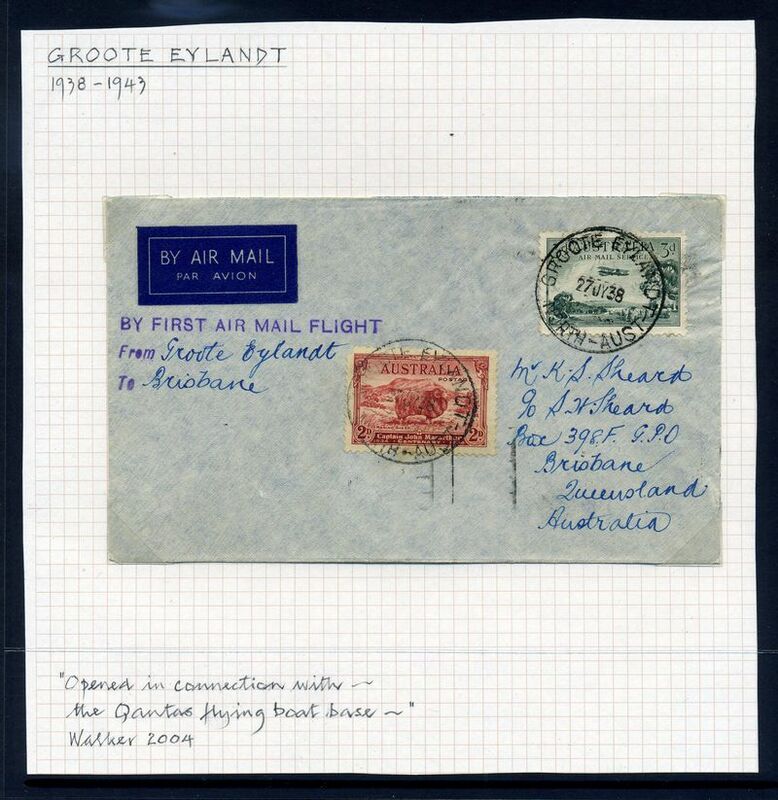 Naidia Commonwealth Type CDS postmark on 1940 2d AIF issue. Rated 2R. 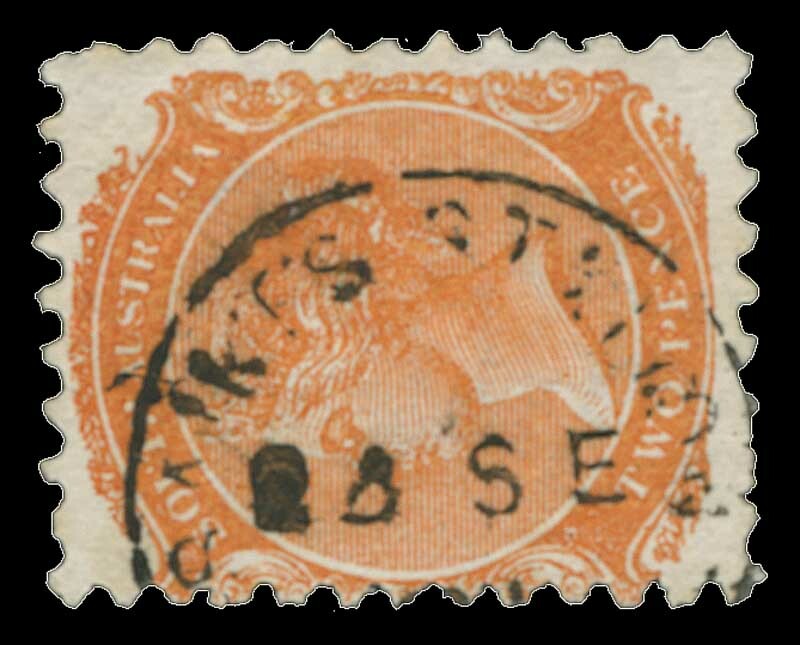 Ngapala 28mm Commonwealth Type CDS postmark on 2½d KGVI issue, on piece. Neat full strike. Rated 2R. Mil. P.O. 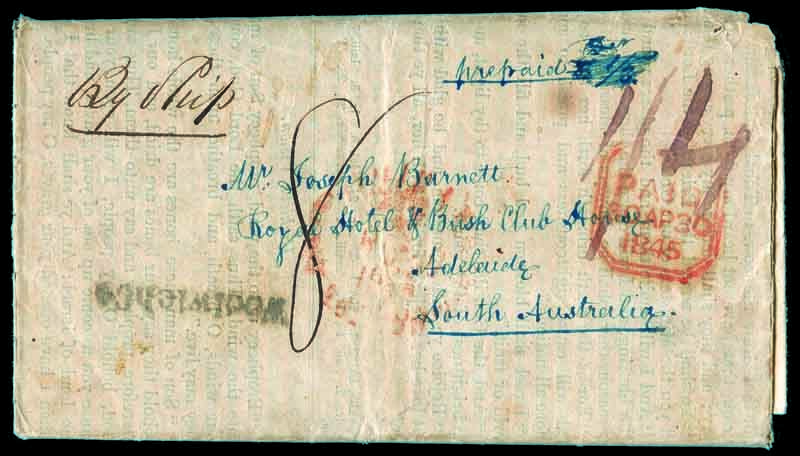 Northfield Commonwealth Type CDS postmark on Australian Red Cross Society cover franked with 1d Purple Brown Queen Mother issue, with Concession Postal Rate marking. Neat full strike. Rated 3R. 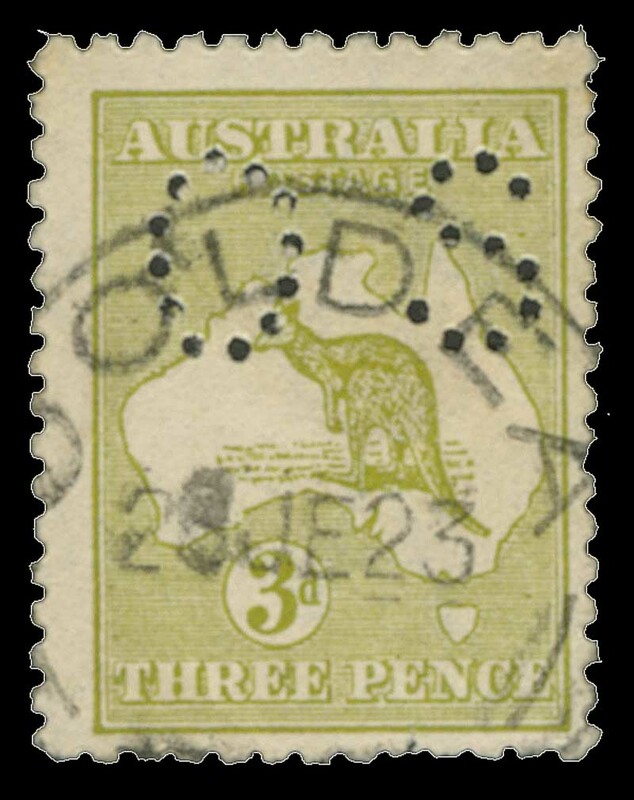 Ooldea Commonwealth type CDS postmark on 3d Green Kangaroo. Rated 3R. P.P. Railway Up Commonwealth type CDS postmark on 1d Red KGV on piece. Near complete strike. Rated 3R. 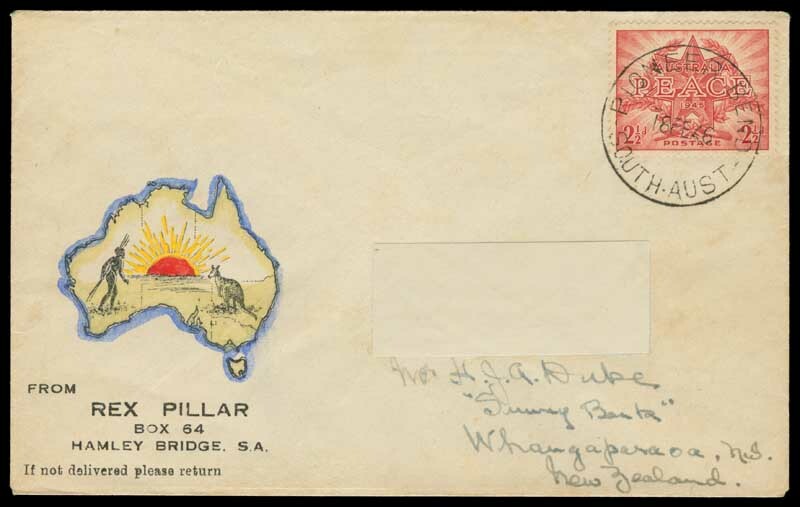 Pioneer Bend Commonwealth Type CDS postmark on 1945 2½d Peace issue on Rex Pillar hand coloured cover, addressed to New Zealand. A perfect clear full strike dated 18 FE 46. The P.S. of S.A. publication lists as no marking known. Quorn - Alice Springs T.P.O. 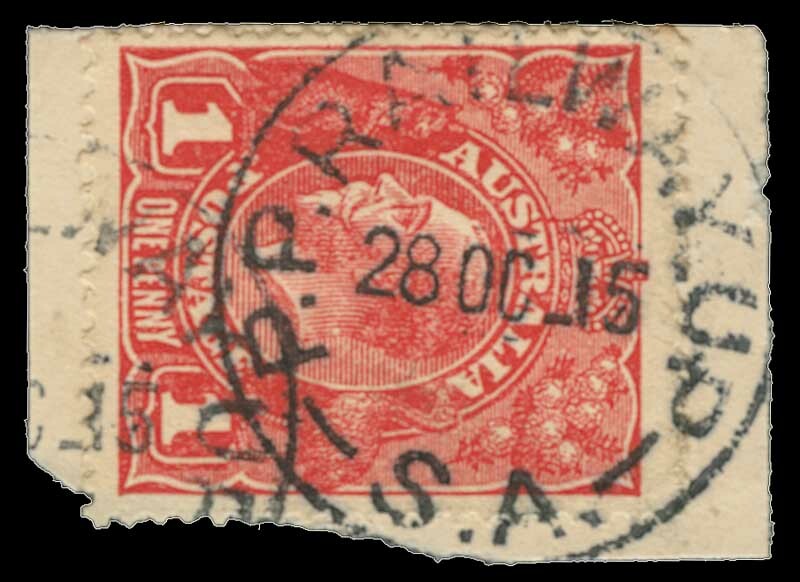 CDS postmark on 2d Red S.A. Centenary issue on piece. A neat largely complete strike. Rated 3R. 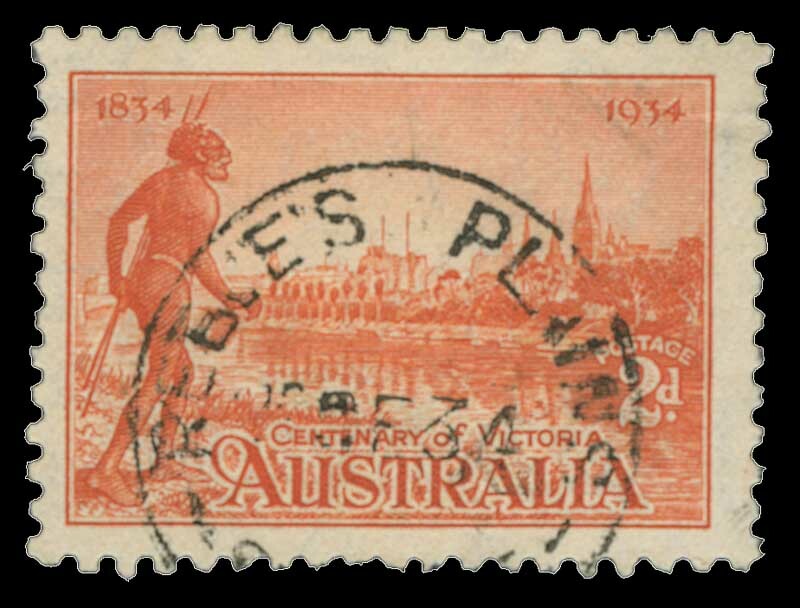 Reeve's Plains 25mm Commonwealth Type CDS postmark on 1934 Victorian Centenary issue. Neat largely complete strike, dated Se 34, a new latest recorded date. Rated 3R. 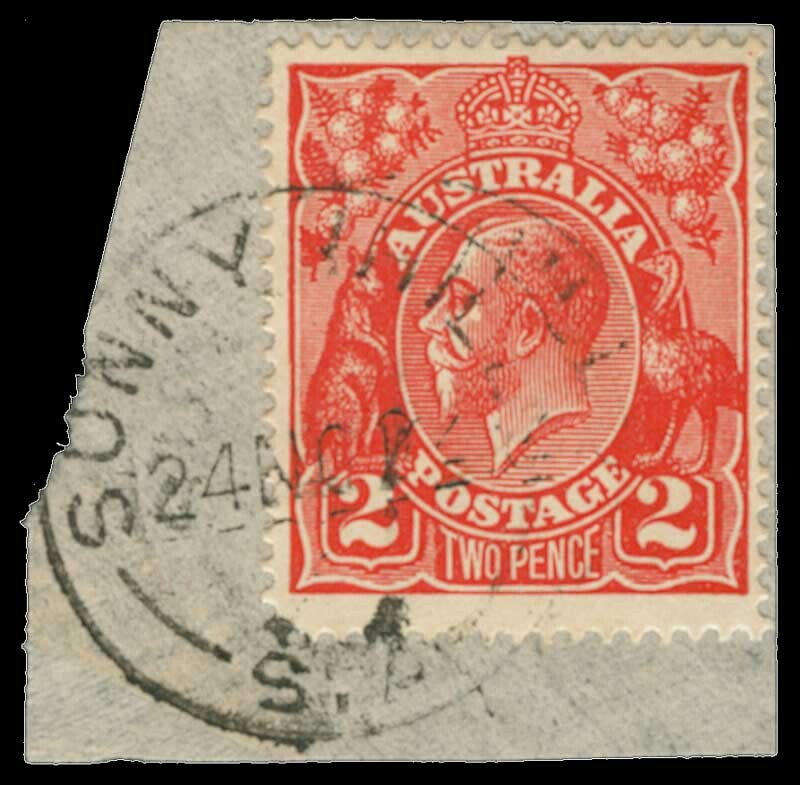 Sunny Hills Commonwealth Type CDS postmark on 2d Red KGV issue. Neat largely complete strike. Rated 4R. 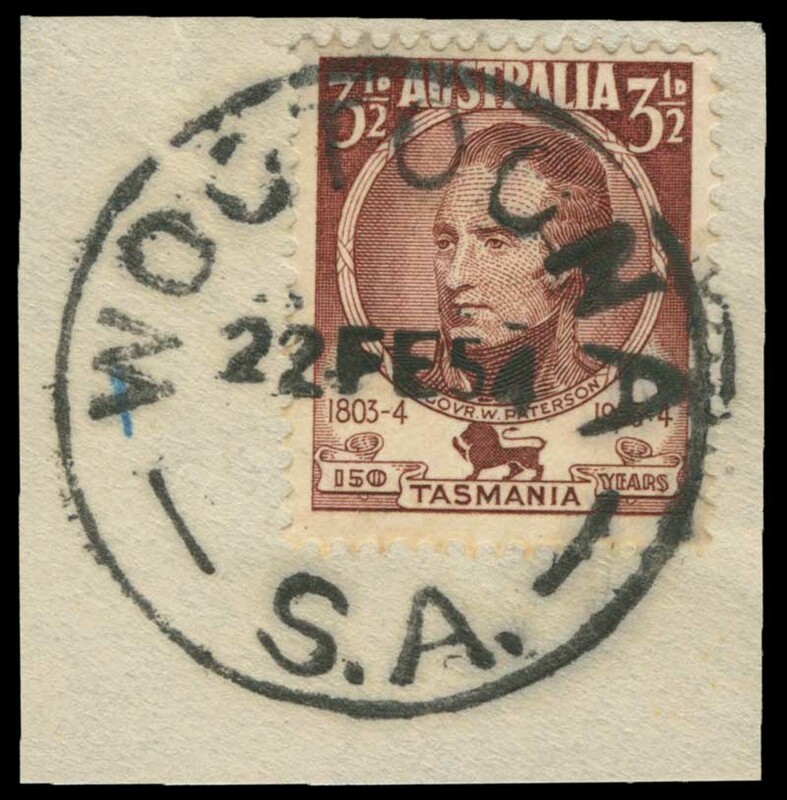 Wootoona Commonwealth Type CDS postmark on 1953 3½d Centenary of Tasmania issue, on piece. Fine complete strike. A new latest recorded date, 22 FE 54. Rated 5R. 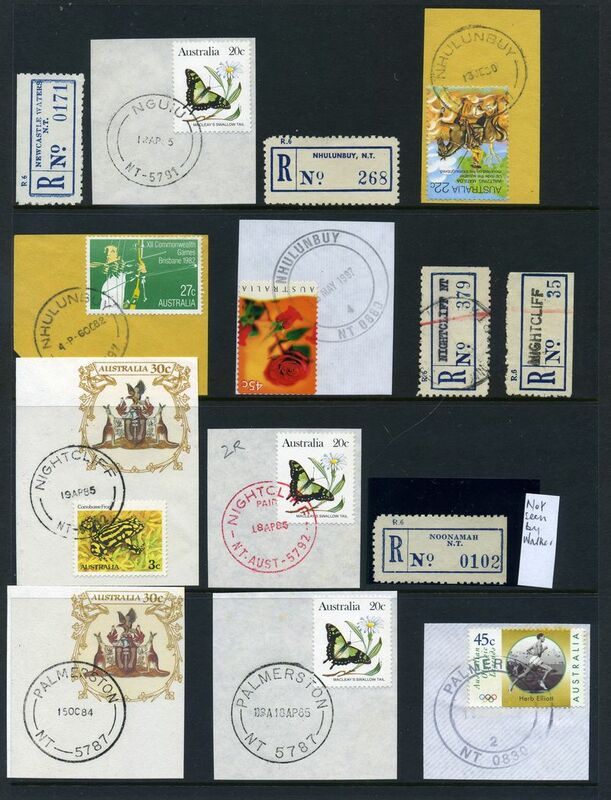 Collection of many hundreds Diamond Numeral, Squared Circle, Broken Ring, Full Ring and Commonwealth type postmarks, from Queen Victoria period to the 1980's with a wide range of offices, mostly on piece, but including numerous covers in Loose Leaf album and 3 large German stockbooks. 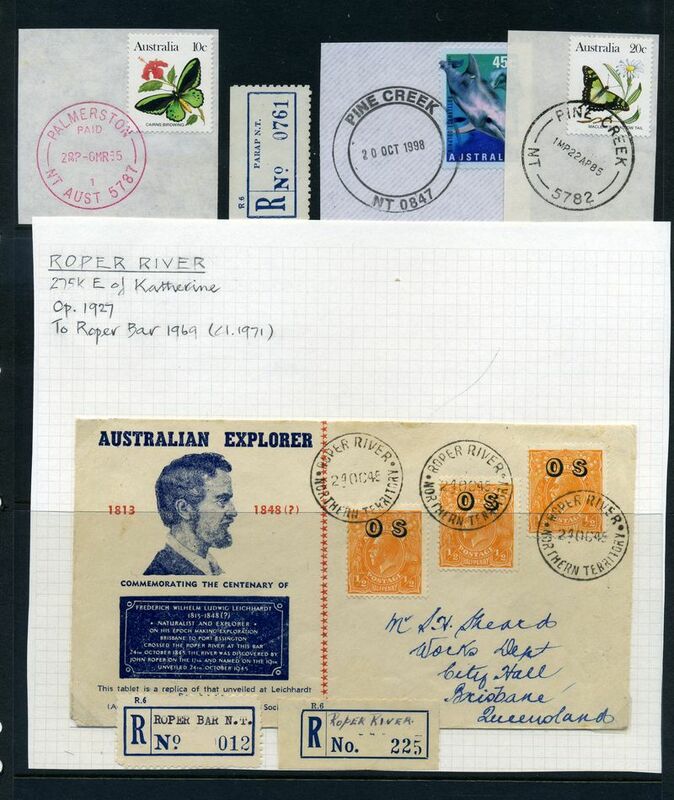 Noted strikes from Aero Park, Angas Plains, Apamurra, Arwakurra, Ashville, Athenna, Australia Plain, Bakara, Barabba, Barunga Gap Oval type on registered cover (unlisted), Bayah, Black Springs, Boolgun, Bradbury, Brooker, Bruce, Bull's Creek, Butler Tanks, Calca, Calomba, Cape Willoughby, Carawa, Carrow, Chandada, Charra, Claypans, Cockaleechie, Colton, Coorabie, Cowarie, Cygnet River, Davenport North, Daveyston, Dowlingville, Dry Creek Railway Station, Elbow Hill, Express Rly. Down, Express Rly. Up, Friedrichswalde, Glenburnie, Glenloth Battery, Gordon, Graymore, Gum Creek, Gurrai, Hamilton, Innamincka, Kalyan, Kenton Valley, Koolymilka, Kringin, Kulde, Lake View, Lochaber, Lowaldies, MacGillivray, Mannanarie, Maralinga, Mapama, Melton, Mercunda, Merilden, Mil. P.O. Exhibitions BLDG., Mile End, Mirra Mitta, Monteith Flat, Mt. Drummond, Mount Gullett, Mount Hope, Mt. Mary, Mt. Monster, Mundoo Barrage, Murdinga, Murnpeowie, Nadda, Naturi, New Residence, Noora, North Booborowie, Notts Well, Nunjikompita, Oladdie, Oodlawirra, Parachilna, R.A.A.F. P.O. Parafield, Parrakie, Trans Aust Railway Pay Train, Peterborough West, Pickering, Pimbaacla, Pinery, Pompoota, Ponde, Poonindie, Pt. Pirie Up, Pygery, Radium Hill, Redruth, Rhine Villa, Rosedale, Sanderston, Sandilands, Snuggery, Mil. P.O. Springbank, Stenness, Stockade, Stockyard Creek, Stonefield, Taldra, Talia, Taplan, Taylorville, Teal Flat, Tetulpa, Tickera, Tuscan, Tweedvale, Ulooloo, Umberatana, Undalya, Ungarra, Urania, Veitch, Verran, Virginia Manuscript (unlisted) and Diamond Numeral, Waddikee, Walkers Flat, Wall Flat, Warrachie, Wattle Flat, Western Flat, Wilson, Winulta, Wongulla, Woods, World End Creek, Wunkar, Yabmana, Yalata, Yandiah, Yaninee, Yantanabie, Yanyarrie, Yatina, Yurgo and many more. 176 rated R, 60 rated 2R and 27 rated 3R and 2 unlisted. Also numerous Registration labels. 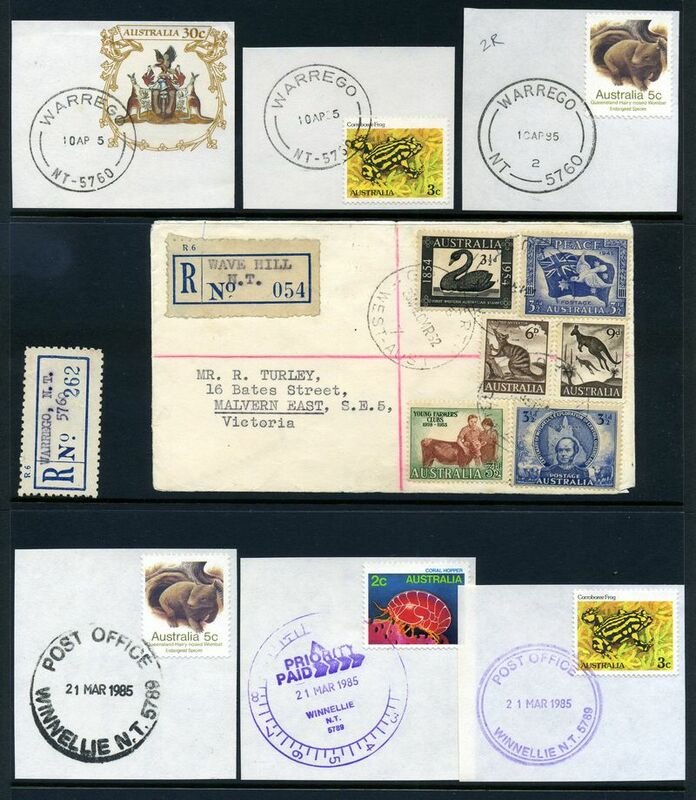 Collection of many hundreds of postmarks on stamps and on piece from various towns with a range of types represented, the strength in KGV period, in good quality stockbook. 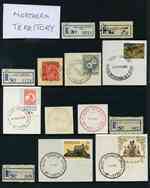 Also a second stockbook with stamps on neat pieces, with strength in the 1980's period. 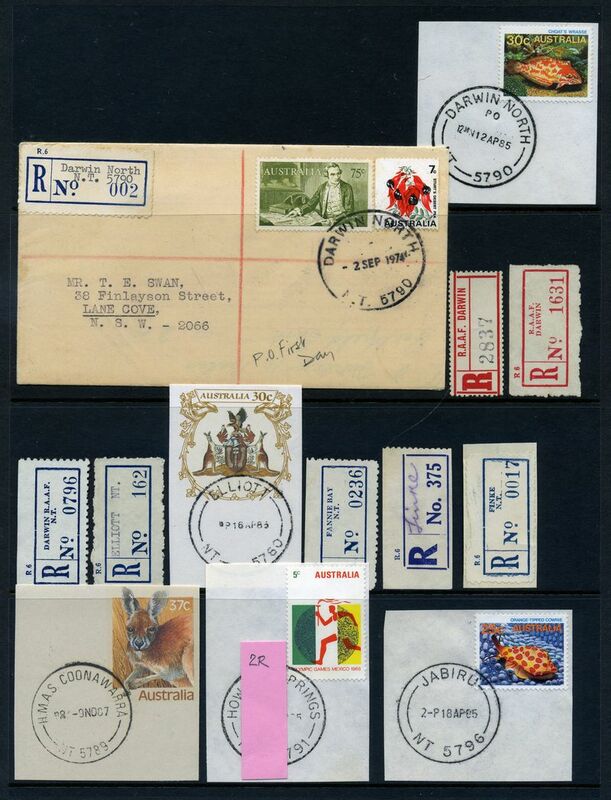 Accumulation of thousands of Pre-Decimal QEII era commercial covers and cover fronts including CDS and Slogan cancellations, paid markings, advertising and company envelopes. Includes a small range of early Decimal. Weighs 15kgs. 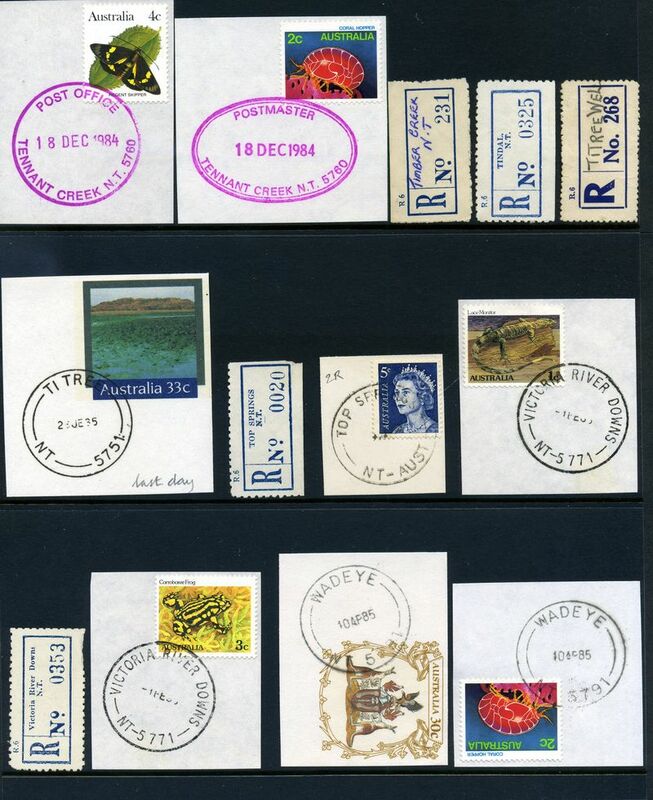 Accumulation of many hundreds of KGVI era cover fronts, all cancelled with South Australian C.D.S. 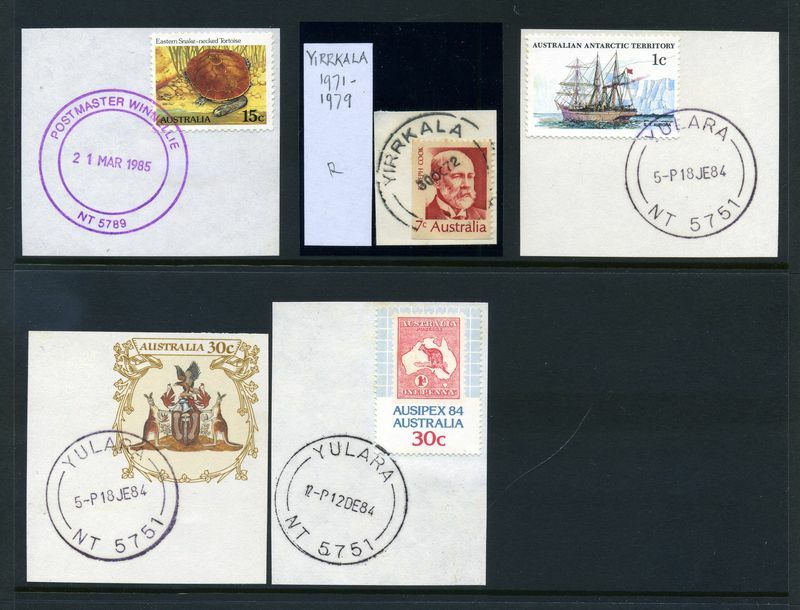 postmarks including some Paid markings. 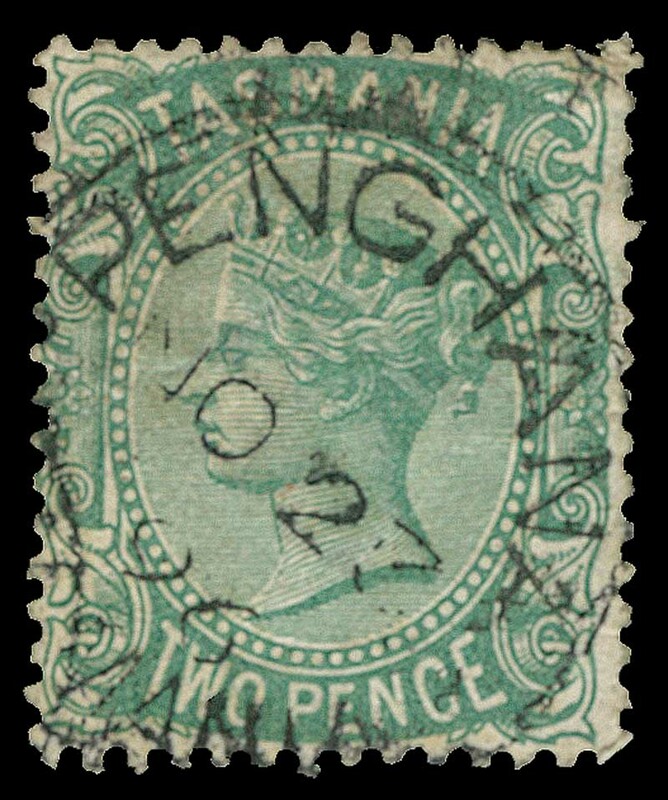 Penghana CDS postmark on 2d Green Queen Victorian sideface issue. A clear largely complete strike. Rated RRRR by Hardinge. 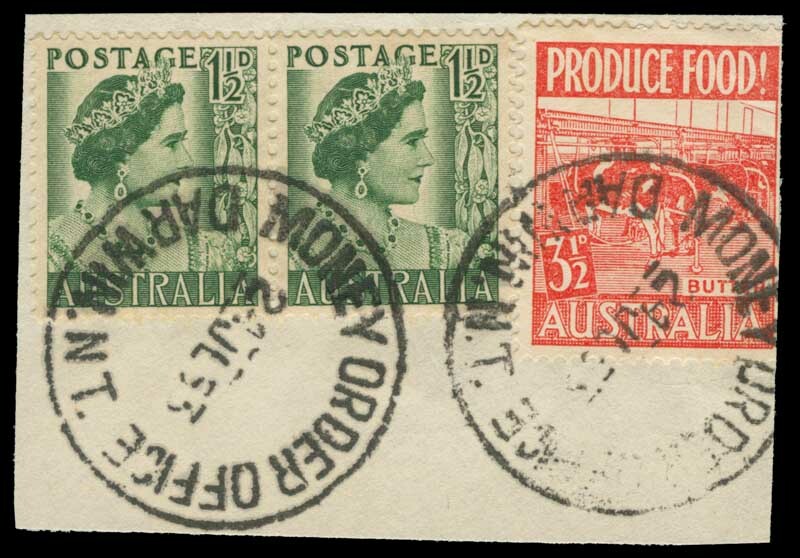 1938 2d Orange surcharged 'One Penny' diagonally in blue envelope addressed to South Australia uprated with 1d Green Die II Small Multiple Wmk perf 13½ KGV, tied by Guilford 8MR38 W.A. C.D.S. cancellations. Unusual philatelic usage. Rare. P&T EN 8. Selection 41 covers from 1900 to 1913, with main strength in New South Wales, Tasmania and Victoria. Some typically tatty. 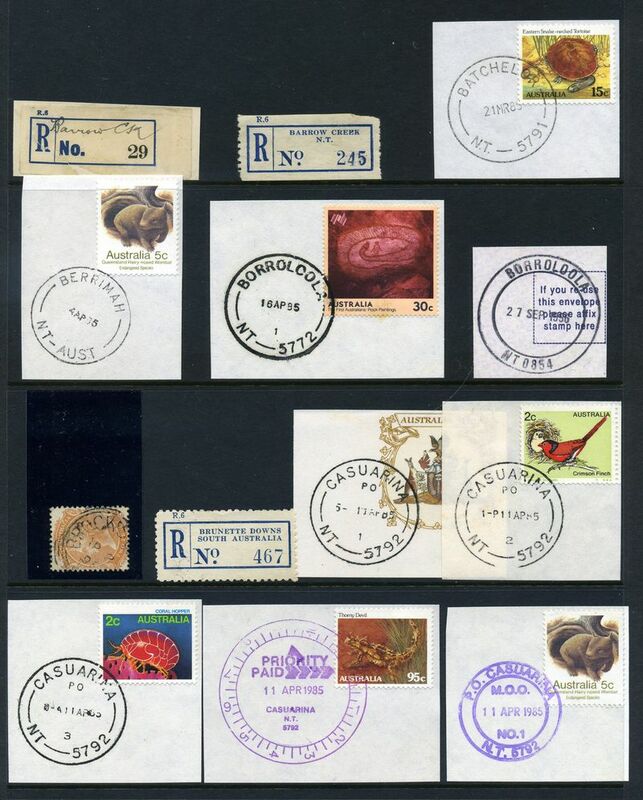 Selection of 70 covers from New South Wales, Queensland, South Australia, Tasmania, Victoria and Western Australia including an interesting range of postal, instructional markings and 4 registered covers. 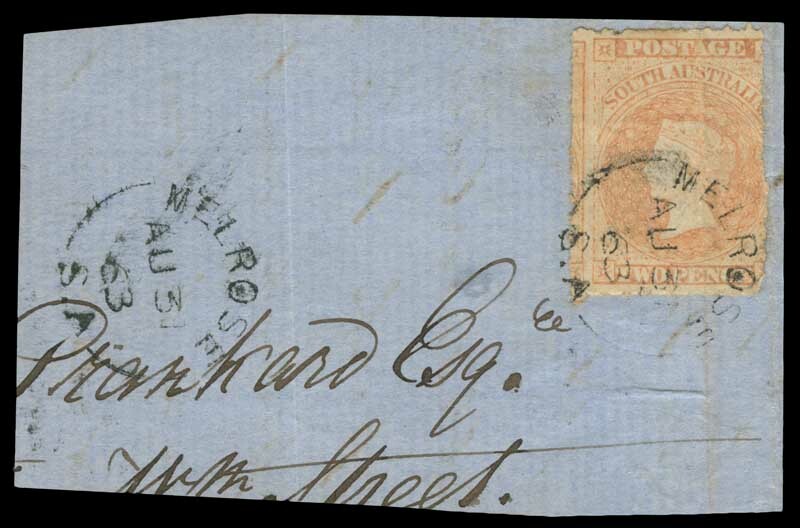 Noted Registered cover from Queensland to New Zealand, franked with 1905 9d Commonwealth issue Type B with Toowoomba registration label, Pt Adelaide to Alberton cover with Alberton MA 8 86 full ring backstamp [Rated 3R] and 2d Red-Orange Queen Victoria tied by Stirling West MA 17 85 full ring postmark with Norwood cogwheel backstamp [both rated R]. Usual variable condition.